MINI Cooper Acccessories + MINI Cooper Parts :: OutMotoring.com MINI Blog :: MINI Accessories :: Wave the white (and black) flag! Wave the white (and black) flag! Synopsis: The checkered flag, that is. Available as side marker housing! If you've got a Gen 1 MINI and are in the "Checkered Flag Club" or just love adding Checkered Flag bits to your MINI, you're in luck. We now offer these replacement side marker housings for the Gen 1 MINI. These are a simple install. 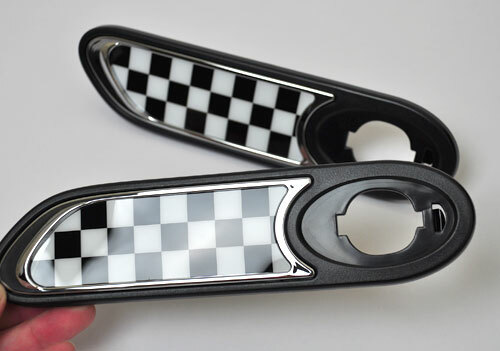 Once you've transferred your existing side marker lights over to these housings, you'll be one step closer to having the perfect MINI...for you. Sold as a set of two. Comments on Wave the white (and black) flag!